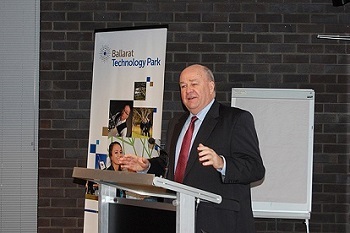 A milestone project partner meeting for Visualising Victoria's Groundwater was held at the Ballarat Technology Park on 16 July 2014. This meeting coincided with the celebration of the 2nd anniversary since the launch of the VVG website. VVG is the first of its kind in Australia to offer real-time visualisation of a resource that is normally invisible to the public. The portal features over 400,000 bores from four authoritative sources, and includes Victorian aquifer information, historical records and maps; the latest addition to the portal now offers 3D visualisation. In the last two years, the VVG web portal has had 17,000 visitors and over 83,000 page views - with a 60% rate of return visitors. Federation University Australia's Vice Chancellor, Prof David Battersby, welcomed project partners to the meeting and congratulated the VVG team on the many successes they have achieved with the project. During his presentation, the Vice Chancellor also announced exciting changes for the Centre for eCommerce and Communications with it now to be known as the Centre for eResearch and Digital Innovation (CeRDI). Pictured above left: Professor David Battersby announcing that CeCC would become the Centre for eResearch and Digital Innovation (CeRDI). 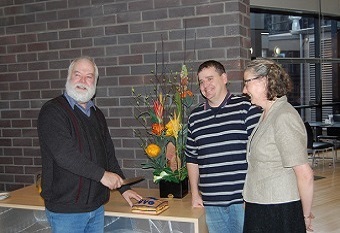 Pictured above right: Peter Dahlhaus, Andrew MacLeod and Helen Thompson cutting the 2nd Anniversary VVG cake with geology layers. The name change recognises the key areas for which the Centre is gaining a reputation for, particularly eResearch, digital innovations and knowledge management. CeRDI will continue to build the strong project partnerships that CeCC has become known for, over the last 16 years. The meeting followed with updates on recent changes to the VVG portal such as the inclusion of EPA data shown spatially, the 3D visualisation tool, user guide to the portal, FAQs and evaluations. Bruce Simons from CSIRO gave an update on the progress of the Groundwater Interoperability Experiment. The VVG documentary was viewed with producers Jary Nemo and Lucinda Horrocks in attendance from Wind and Sky Productions. We received demonstrations of other groundwater tools: the Australian Groundwater Explorer in the National Groundwater Information System (NGIS) from Jill McNamara (Bureau of Meteorology) and the Water Measurement Information System (WMIS) from Emma Davidson (Department of Environment and Primary Industries (DEPI). In addition, Liam Murphy (Southern Rural Water) provided an update on the on-line groundwater atlases for southern Victoria, and Don Cherry from DEPI reported on a new initiative to model aquifer parameters and quality for each of the components of the Victorian Aquifer Framework (VAF). New collaborations have emerged from this project, such as the Groundwater Interoperability Experiment that involves organisations internationally, including CSIRO and as well as the 3D visualisation for the Bureau of Meteorology's National Groundwater Information System (NGIS). Federation University Australia would like to thank all of the project partners who contributed knowledge, data, time and funding to the VVG. As a result, the VVG has become an outstanding example of what can be achieved through collaboration. Every member of our diverse team of partners and contributors has played an invaluable role. A formal evaluation of the VVG project is underway with the opportunity to participate via a one minute Snapshot survey or slightly longer Online survey. Interviews will also be conducted with project partners. This research will inform future academic and other publications. The VVG website will continue to be hosted and updated by Federation University Australia to ensure that this valuable resource remains online and current. Pictured above: VVG partners and collaborators meeting participants on 16 July 2014.